Best. Meal. Ever. EVVVVV. ERRRRR. I cannot find the words to tell you how amazing this bowl of food is. The flavor combination. Crisped brown pulled pork bits...charred bright, yet earthy tomatillos and jalapeños whirred into salsa perfection. Tangy, fresh verdolagas that almost hint at lemons. All mingling together...nestled in a pot with garlic, onions, and potatoes. This IS possibly the best thing I've ever eaten. The best part was when I went to eat leftovers the next day and those amazing flavors came back full force...triggering that dreamy smile with every bite. I may even choose this for my last meal...should I ever have to make that decision knowingly. One day, about a month ago...I made a wish. I wished that I had verdolagas growing in my garden. You see, my garden is fairly new. Mexi finally got around to tilling me a space in the backyard and enclosing it with re-purposed wood from around the property. Property makes it sound substantial. It's not really, but it was here and there in the yard, around and in the garage, etc...so I thought property was a good term. When we moved in last year, Mexi noticed some verdolagas in our neighbors garden. I was intrigued, because it was something I hadn't heard of before. 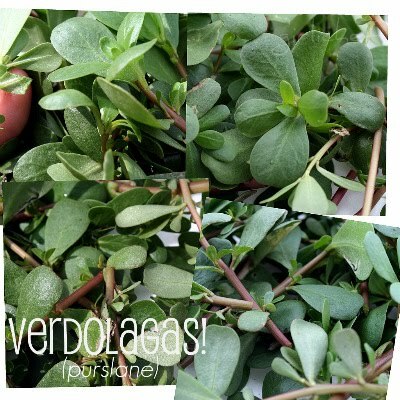 So, I did a bit of research and found out that Verdolagas were just Purslane (in Spanish). Purslane I had heard of...but still was not familiar with it. I knew it was an edible weed. One that most people just cursed and pulled from their gardens. Well, we proceeded to ask our new neighbors if they knew that the purslane in their garden was edible. They didn't. Nor did they care. I proceeded to watch them weed it out and discard shortly after we were so kind as to tell them there was food they didn't even know about right under their very noses! Urrggghhhh. Frustrating. So I dreamed of the day when I would try verdolagas for myself. Mexi told me how delicious it was with pork...and I believed him. Moving back to this year and my newly readied piece of earth...I planted 3 types of heirloom tomatoes and some herbs. It was late in the season and I wanted to start small and dream big. I thought it was a good start...something to add to the various things I found already comfortable here...the grape vines, the mint, the chamomile, the ground cherries, the yucca. As I thought about the verdolagas in the neighbors garden, I wondered if they would transplant well. Perhaps I could ask them if I could dig them up and put them in my garden. Hmmmm....that's a good idea...especially since they don't want it anyway. I just wished that I had some verdolagas in my garden. Fast forward two days. Yes, really...two. I walk out to check on my tomato plants and herbs after some severe weather...wind, rain, heat...to find that my wish had been granted! I don't know if a lovely fairy carried some seed from the neighbors garden to mine...or perhaps it was a bird or an insect...but lo and behold, there in my garden...were my very own edible weeds!! I could barely contain myself! You never saw a girl so excited to have some weeds in her garden. I hopped in and walked around looking at the different patches of verdolagas spread throughout the garden. I ran back in the house like a kid with a new toy to tell Mexi!!! Oh yes, I made sure to take off my flip-flops at the door. 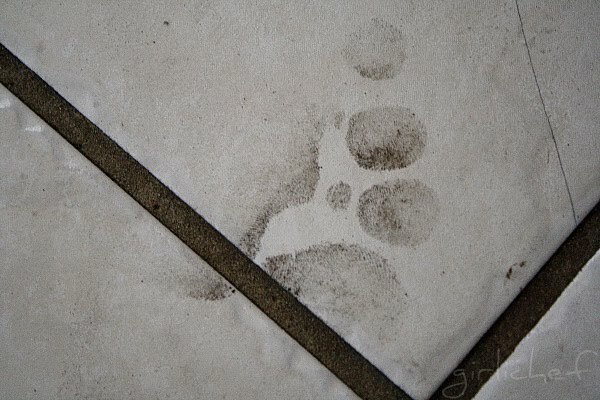 The ones I had just worn to walk into the still-wet rich earth that is the garden. But, um...flip-flops and excitement do little for keeping the mess away. Oh well. Woo Hoo! And what's even better...purslane grows, well...like a weed go figure! If you snip it off almost all the way to the ground, you can go back a few days later and see substantial growth! I usually end up getting enough to use for one meal every week! It's a light, almost lemony-scented green that you can eat raw tossed into a salad or cooked. I don't know why I'm not able to find it anywhere else around here. Not at the farmers market. Not for sale at any roadside stands. Not in any market at all!? Fortunately I don't have to look any further than my own back yard any longer. Now, let's move on to the most fabulous dish ever. Seriously, it tops anything I've eaten in ages. I am still dreaming about it, even though it vanished from the pot...and the fridge...a few weeks ago. I've eaten verdolagas in different forms since then, but even as I sit here trying to convey to you how effing fabulous this dish is, I'm making a mental note to make another pot. 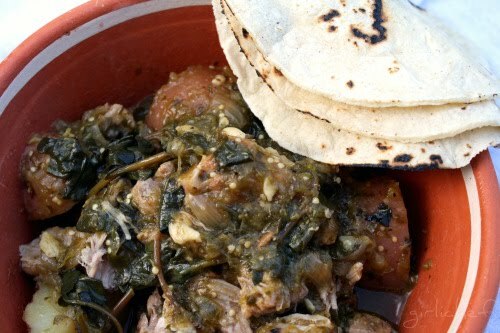 This recipe is adapted from a recipe for Costillas de Puerco con Verdolagas from Rick Bayless's Mexican Kitchen . 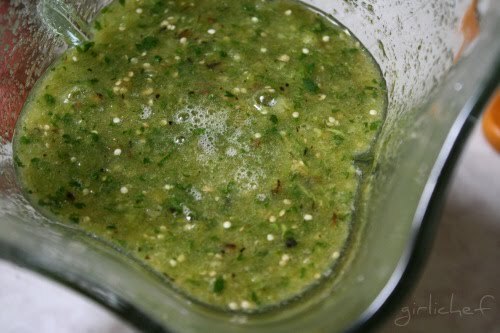 Begin by making a salsa verde...broil or roast the tomatillos and jalapeños until the skin is well-charred. 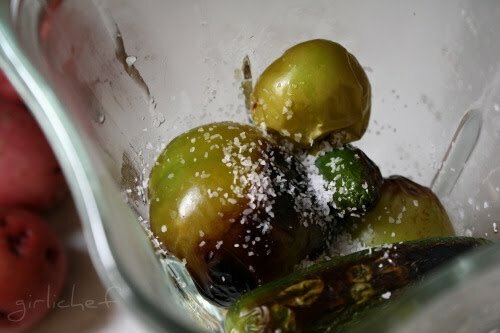 Put them into a blender jar (being sure to use all the juices they've release, as well) with a big pinch of salt and pulse quickly to break them up. Toss in the cilantro and measure in enough cool water to make ~3 c. Blend until smooth. This is the same method I use for making salsa verde for drizzling on tacos and mixing w/ shredded chicken to put into tamales...although I usually char a few garlic cloves along w/ the other veggies when I'm using it for that purpose. Just add them in and proceed as usual. 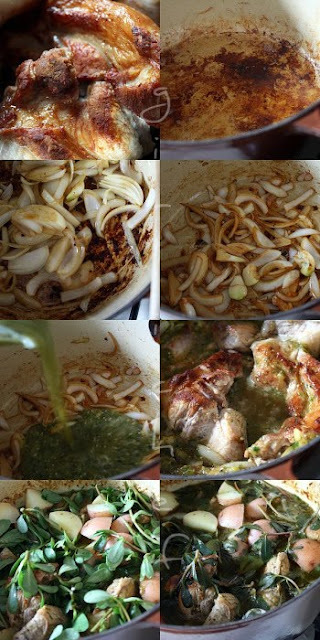 In a large pot or Dutch oven over medium-high heat, pour in enough oil to coat the bottom well. Make sure your pork is dried off, sprinkle it with salt and then add the hot pot until all sides are golden. Do it in batches, if necessary. Transfer them to a rimmed plate or bowl. Pour off all but a thin coating of oil from the pot. 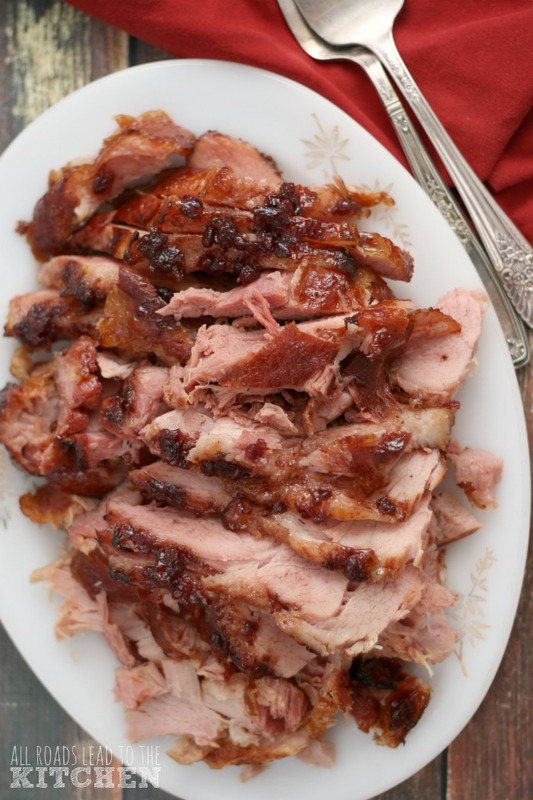 Make sure to leave all those gorgeous golden bits (fond) that are stuck on the bottom...that's flavor, baby! Add the garlic and onions to the hot pot, stirring occasionally until the liquid released from them has stirred up from pot and coated them and they have just begun to soften. 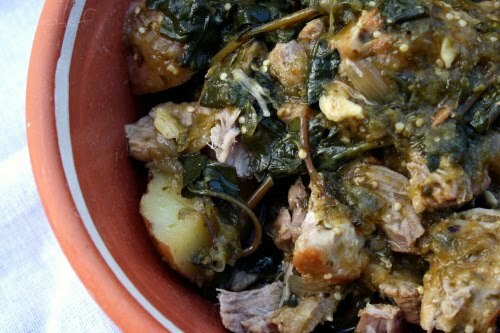 Pour the salsa verde into the hot pot and then nestle the browned pork back into the pot. Bring it to a boil, then cover the pot and place in the preheated oven until the meat has begun to get tender, 75-90 mins. Remove the lid and poke those potatoes into the spaces between the meat. Cover and cook an additional 20 minutes. Now, throw those handfuls of Verdolagas into the pot and stir them around a bit. Cover and cook another 10 minutes. Set on the counter to cool for ~10 minutes or so...until you can handle it without searing the skin fromm your fingers. It'll be hard...the smell will do that little cartoon-waft into your nose and you may go a bit crazy from the wait! Ladle big spoonfuls into bowls and prepare to be blown away. Wrap some in hot corn tortillas. Eat it as is. Just enjoy. You might think I'm exaggerating. But you'll never know until you've tried it for yourself. Best. Meal. Ever. Pile the leftovers onto a sope for another taste sensation! Equally fabulous piled onto a thick, crispy sope! This is how we ate the leftovers the second day...topped with cilantro and drizzled w/ crema. The flavor explosion and textures of the carnitas con verdolagas were amazing atop the sope...again, I don't know how to convey to you the mind-blowing experience of each and every mouthful of this! 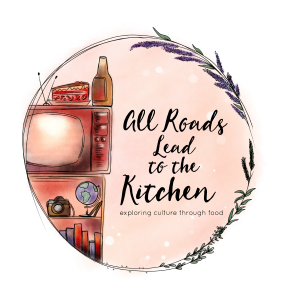 *This is my entry into GYO (Grow Your Own) this month hosted by Andrea also the creator from Cooking, Gardening & Four Hungry Guys...where you enter a dish you've prepared from something you've either grow, foraged, caught or hunted yourself! *Update 3/28/11: I am submitting this to BSI: Salsa hosted by my pal Tina at Life in the Slow Lane at Squirrel Head Manor this week. 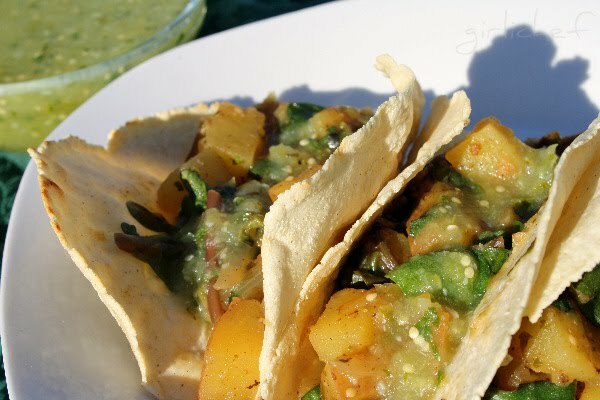 Make a vegetarian taco filling by cooking up some potatoes and verdolagas in salsa verde! 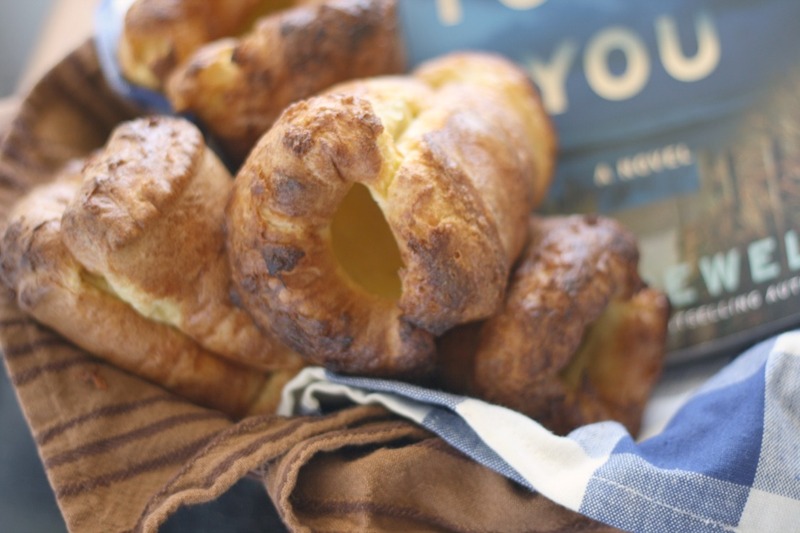 It looks crazily comforting and delicious! I need your help!!!! You seemed like a great person to ask to solve our dilemma - what's the difference between guisada and guizado? Is it a region thing or just the misspelling of a word? Yoğurtlu semizotunu bende çok severim. Çok ilginç bir tarif olmuş ellerinize sağlık. Verdolagas is something new to me but this looks very very good..
Yummy! Talk about comfort food...and you can't beat it when it tastes just as good the next day! girlchef, you are amazing! This dish looks delicious and I just want to pull up a chair to your table! I'm a total sucker for carnitas! 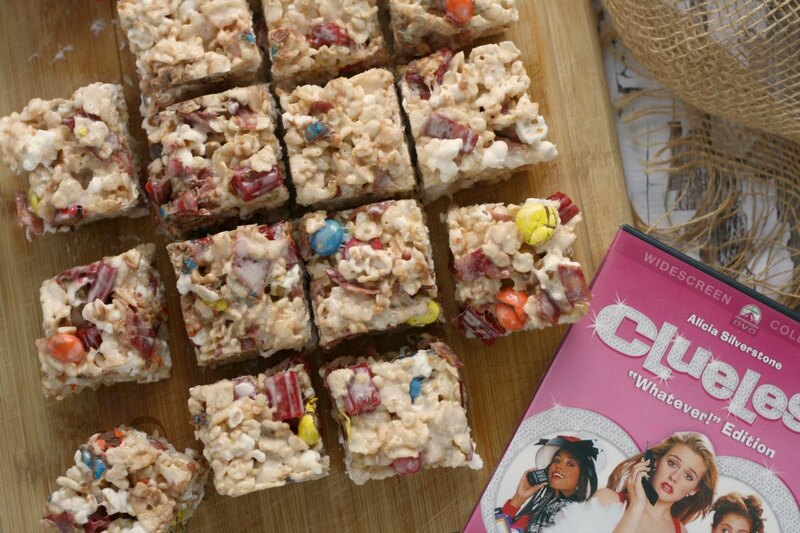 These look and sound melt-in-your-mouth good! Heather I love the way you write. It's a few hours for my dinner time and now I wish I was making your carnitas. It's great to hear that your esposo and you got your verdolagas :) The sopes and carnitas looks finger liking good! I'm totally laughing over here. It's so funny that we both posted our favorite recipes that we've made in some time and they both have greens in them! I have heard of purslane but had never seen it. If it has a lemony flavor at all I know that I would love it and I can definitely see how this could be the tastiest thing you've ever ate. Love that it's flavored with lots of garlic and jalapeno, those two have been my favorites for EVVVVV. ERRRRR - LOL! I love carnitas. You have totally sold me on your recipe and I just happen to have plenty of verdolagas in my garden. I must admit to having pulled it from my lawn and garden many times when we lived back east. If only it was anywhere to be seen now. oh wow, my mouth is watering, don't you love it when you totally hit the jackpot! delicious! I have a garden full of purslane. I must admit to pulling it out and throwing it away. I have carpets, carpets, full of it. I just recently found out it was edible. 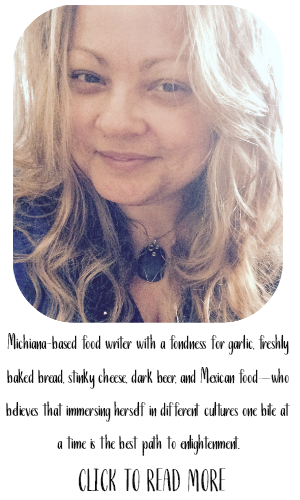 I love Rick Bayless's recipes and I AM going to try this dish. Thanks for the recipe. I'm hopping around with excitement also because hot damn I want to eat this! I can see why you are still swooning over this dish. I have neighbors just like yours-they would not have a clue to what I was talking about and certainly, they would have told me, I would not want to eat the weed out of their yard (laugh). I am seriously going to check the weeds in my yard. Maybe, I have purslane growing, and I don't even know it! You inspire me. I want a garden, I want to mingle with the plants and have my hands smell of tomatoes and fresh greens. Deer always, always eat everything but I recently heard if we sprinkle our hair around the plants, they leave you alone. Hi Girlie. Yes I know about verdolagas. My Dad used to grow it and sometimes even went yard to yard to see if the neighbors had it. He make it with chili colorado/chili verde and it was awesome. My stepmom didn't want to eat it because she said the dogs and cats did their thing on the plant. Ayeeeee! Anyway, I get it every year when my plants start producing. This year I will pick some, wash it good, and do like my Dad used to do. Thanks for sharing your great recipe. Looks really good. It's not a weed, it's a wild edible plant! So glad to hear that you were able to cultivate your own. I'm thinking of growing it as a ground cover in my garden next year - step on the bits in the path, and harvest the bits under the plants. I've got a little patch of it next to my driveway, and have included it in most of my dinners for over a month now. Can't beat the lemon-y-ness, and as much as I hate nutritionalism, the stuff is jam-packed with omega-3's! I saw verdolagas at my latin grocery, but the leaves were so ginormous that I hardly recognized it as the same plant in my garden. 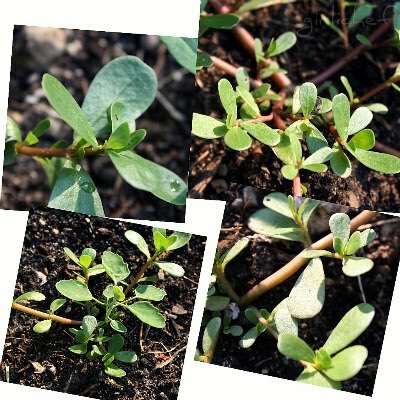 I was wondering if it would be wrong to import a non-native plant into my garden, knowing how well purslane transplants. I was eagerly waiting to find out what verdolagas were and so excited to learn that they're puslane! I've been seeing this all over and now I wish this weed was growing in my yard. 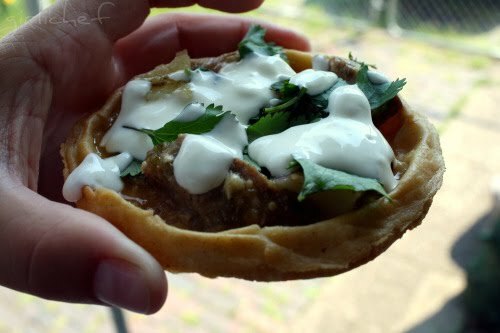 This looks delicious, but the final version on sopes is fabulous! Aha! No, not really, fenugreek (Trigonella foenum-graecum) is not a succulent like purslane (Portulaca oleracea). While fenugreek can be on the bitter side, I'm guessing that purslane is not bitter at all. And I see from reading that purslane has little yellow flowers too (hey! so does fenugreek!) Are the flowers edible too? Actually, I looked up weed and yeah, it is the same thing... "any plant that crowds out cultivated plants"..."A plant considered undesirable, unattractive, or troublesome, especially one growing where it is not wanted, as in a garden."... "A weed is a plant out of place not intentionally sown, whose undesirable qualities outweigh its good points. Some crop plants even can become weeds when they grow where they are not wanted. In contrast, a number of plants usually thought of as weeds may actually be helpful in controlling erosion or serving as food for wild animals and birds." So, I think I'll just leave it at weed. I mean, I really enjoy this verdolagas, so perhaps it shouldn't be considered a weed...cuz it's going against that definition. But many DO consider it a weed. Sounds so delicious as you are describing it. Lovely. What a fantastic dish...very interesting :) Beautiful photos! now that dish look so very very good! 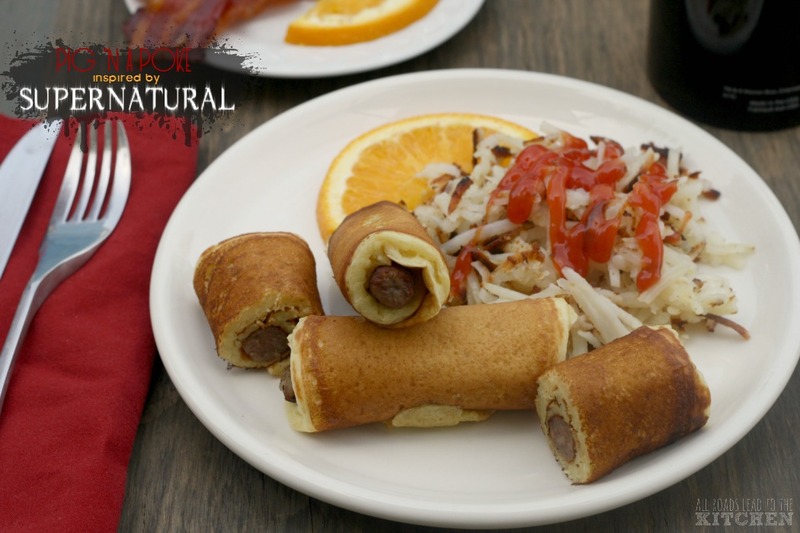 I would love to try it, thanks so much for a great post and sharing this wonderful recipe! We were so entranced by this dish that we bicycled to the market today to get verdolagas (alas, they didn't have any, nor did they have any idea what we were talking about). But they did have lovely tomatillos, cilantro, jalapenos, hot shepherd peppers and limes. While we might not be able to make exactly what you did tonight, we're very excited about what is shaping up to be a spectacular dinner. Thank you!! How wonderful! We grow tomatillos plus every weed known to man EXCEPT purslane. I've foraged around the neighborhood looking for some I can dig up and transplant to our yard, but so far no luck. Thanks for sharing your carnitas with Grow Your Own! Thanks for the BSI submission, tooooo yummy! !